Carbohydrates can be a little confusing, sometimes people talk about complex carbs as "good carbs" and simple carbs and often refer to them as simple carbohydrates as "bad carbs." But I don't think it's accurate to say all simple carbs are bad, some are good. Let me explain a little about the biochemistry of simple carbohydrates. As far as chemical structure, simple carbs are small molecules consisting of a monosaccharide or two monosaccharides linked together. Anything bigger than that is called a complex carbohydrate. Okay, so what's a monosaccharide? It's just the fancy word for a single sugar. Glucose is a monosaccharide, and it's a good sugar because it's the type of sugar your body and brain use for fuel every day. Other monosaccharides include fructose, which is found in fruits and vegetables, and galactose, which is found in milk. None of these are bad for you. Lactose (milk sugar) is made up of glucose and galactose molecules. People who are "lactose intolerant" can't digest this sugar properly. Sucrose (table sugar) is composed of glucose and fructose molecules. It's the white powdery or granular substance we typically refer to as "sugar" when we're cooking or baking. Maltose (malt sugar) is produced during the malting of cereals such as barley. Simple carbs are fairly easy for your body to digest. Not much happens in the mouth or stomach—most simple carbohydrate digestion occurs in the small intestine. Enzymes break the simple sugars into individual components that can cross the intestinal walls of and enter your bloodstream. Any sugar your body doesn't use for fuel is converted to fat and stored in adipose tissue. Are All Simple Carbohydrates Bad for You? As I pointed out earlier, they're not bad molecules—your body likes them in the right amounts. 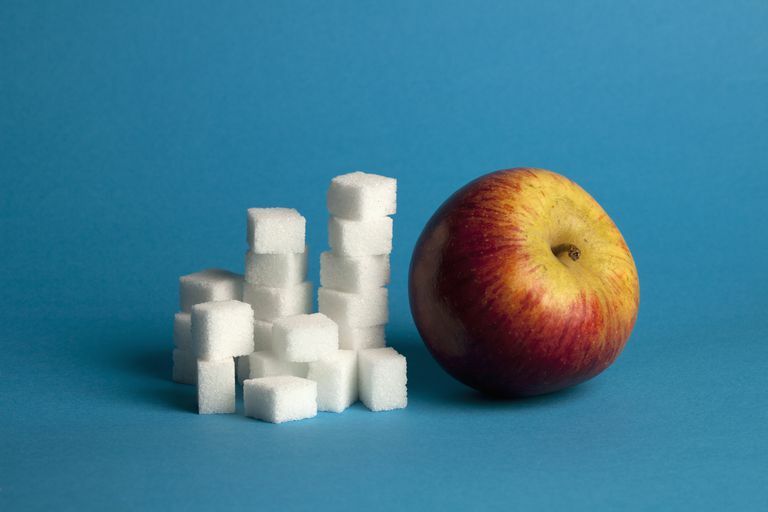 Like many things, it's the dose that makes the poison, so the problem is that foods high in simple sugars have a lot of calories, and too much sugar isn't good for you. Fruits and vegetables naturally contain fructose—but they're also good for you because they're nutrient-dense, and they contain fiber that slows down the digestion and absorption of sugar. Fruit juices that don't contain fiber can still be very nutritious, but the simple carbohydrates are absorbed much more quickly without the fiber to slow digestion down. So that's why it's better to eat whole fruit rather than drink fruit juice. Milk contains lactose, which is a problem for people who are lactose-intolerant. People with this condition must avoid milk and many other dairy products or use supplemental enzymes called lactase that help them digest milk sugar. The United States Centers for Disease Control and Prevention. "Nutrition for Everyone: Basics: Carbohydrates." Is Sugar Really Healthier For You? What's So Special About Turbinado Sugar?